A game that I made a point to play because of all of the great things I had heard was Through the Ages . 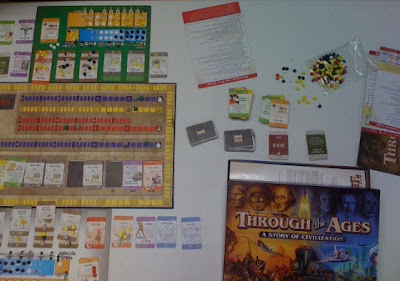 In Through the Ages, each player represents a civilization that is attempting to gain the most culture (victory) points. Since you each represent a civilization, you each have a government; which then determines how many civil and military actions you have each round. Each turn starts with the oldest cards from the "card row" (available developments, essentially) being cleared off, the cards being shifted down, and then the card row being refilled. From here, the active player has the option of playing a Political Action (attack an opponent, setup a global event for later, etc), and then they are able to take their normal actions. The actions available can include taking card(s) from the card row, building or upgrading buildings, training military units, discovering new technology (assuming you have enough science), and working on a wonder (among other things). Once the active player has completed all of their actions (that they choose to perform), he cleans up his turn - generate victory points, science, and food, consume food, generate resources, see if you're corrupt, draw military cards. The game continues like this until one of the Ages is over (which one depends on if you're playing the basic, advanced, or full game) - at which time a few extra things score points. Finally, whoever has the most points wins. My first pro about Through the Ages is how well the game "flows." Once you understand the basics, the game mechanics are not very complicated. Each turn, you follow the same steps (though with many options because of the cards) - the question boils down to who is able to most efficiently use their actions. While most civilization based games can be very intimidating - between how the mechanics work, the setup time, and how the actual components are designed - Through the Ages is pretty easy to follow. The next pro that I have for Through the Ages is that it is a "light" civilization game yet still has depth. I often hear Through the Ages described as a "civ-lite" game. To an extent, that is true - you can play Through the Ages in closer to 2 hours (even in the full game) than 2 days. However, Through the Ages definitely still has the depth to it that people who enjoy empire building games crave - your civilization can go to war, make raids, have leaders, build wonders, and discover technologies. Whoever is able to best capitalize on all of these elements will be victorious. The third thing that I like about Through the Ages is how the "card row" works. This is really the mechanic that the entire game hinges on. Each turn, there are several cards that are available to the active player (I think it is 13, but I'm not sure). The cards that have been available the longest cost the least number of actions to put in your hand, whereas the new ones cost the most. At the start of each player's turn, a certain number of cards are removed from the front of the row; therefore you can wait to purchase a card so that it will become cheaper. But, if you wait, you risk one of your opponents taking the card. And if you wait too long, the card will go away of its own volition! This really does a good job of depicting the concepts of seizing opportunities, missed chances, and opportunity cost. Also, because the cards from the front of the line are discarded each turn, it really keeps up the pace of the game. The final thing (that I will mention) that I liked about Through the Ages was how you kept track of everything. There are several different elements to the game - victory points earned each round, military strength, current amount of science, science earned each round, happiness, etc. The components for Through the Ages were brilliantly designed to allow you to easily see all of this at a (few) glance(s). This is another area that helps keep the pace of the game up without getting you as bogged down in the details. Specifically, you have a track not only to keep track of VP and science, but also to keep track of how much VP and science you gain each round - this way you don't have to re-add them up each turn. Whereas, this is by no means a game mechanic, it is definitely a wonderful aspect to the game that any other developers of empire building games need to shamelessly steal (quick, Eagle Games, go get it patented somehow)! Unfortunately, there is still a con for Through the Ages that I have to mention. And that is, this game is "fiddly." Though the maintenance of this game works much better than most empire building games, there are still lots of things to adjust throughout the game (and on each turn) - and if you fail to adjust them, you might not notice for several turns. Not noticing that you should have been gaining one extra science per round can cost you a lot of valuable points. Again, this works better than in most empire builders, but it still is a nuisance to keep track of all of your civilization's different statistics, spent actions, and available resources. Overall, I give Through the Ages a 9.5/10 (I only really debated between 9.0-9.5). It is by far my favorite empire building game. Unfortunately, since it still can take approximately 2 hours to play and is very intimidating looking to new players, it probably won't get as much playtime as it rightly deserves. I have been thinking about buying a new long game and this one sounds like it might be worth the investment. Thanks for the review. I play this game with my spouse regurarly. Over 2 yrs we have had at least 400 match between us. We'we managed to compress total play time from starting 5+ hours (we have German edition, You Spiele Erfinder!) to 1.5 to 2.5 hrs depending on the style the end comes near. Beginning 50 games excluded we never have not been able to make decisive cut throat difference in cp within 1I & 2II Michelangelo being nonefficient for the risk and Shakespeare (banned from our stack of 2 players) being too powerful for just one nation to hit it. So it comes to third. We spend most of the time there counting chances and resources outcomes to invest in CP production and second, possibly third ageIII wonder for another instant 20CP+. Have to comment also that reseach game has been more often victorious than straight build CP up to the max +30CP while building for Hollywood. Internet as extra might secure Hollywood. These new leaders and wonders are a lots of fun randomizer also. Anyway mil.stack III is more in favor for tho one committed to play research style game. And one more thing to notice in 2player full game. You cannot avoid conflict in there after You learned the game mechanics. You will start to see when the hammer is about to fall measured by CP gain projected compared to Your potential to hit. You will start playing. Many cards and situations will turn in benefit of more forceful/resourcefull player. You did play them cards in advance in the deck?